Trump Administration Faces 2 Legal Challenges For Asylum Restrictions As Trump cracks down on asylum-seekers, federal lawsuits argue that the administration is turning its back on legal precedent and international law. 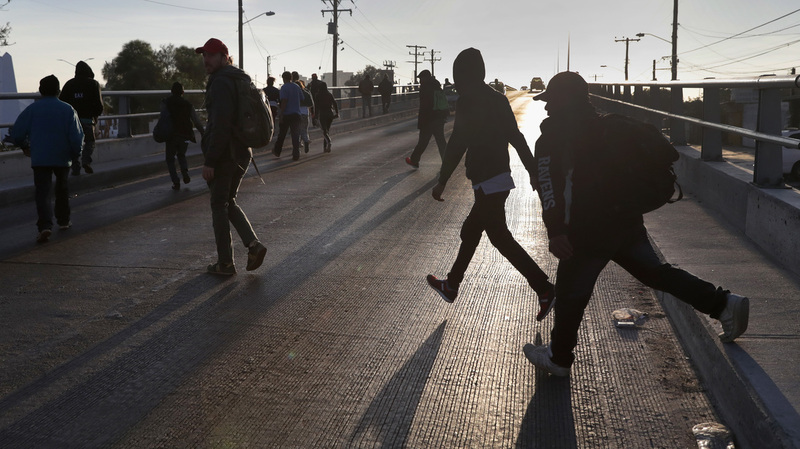 Migrants walk to the U.S.-Mexico border in Tijuana, Mexico, last week to make requests for political asylum. A federal judge in California heard a challenge to the president's recent proclamation that requires asylum-seekers to present themselves at official ports of entry. The language of the proclamation makes clear that the administration is primarily concerned with the migrants moving north through Mexico. But a lawsuit filed by the American Civil Liberties Union, the Center for Constitutional Rights and the Southern Poverty Law Center argues that the president's proclamation violates federal law in two ways: First, it bypasses rules requiring at least 30 days for "notice and comment" on changes in government regulations; and second, it limits asylum-seekers to ports of entry. Under current federal law, migrants may apply for asylum inside the U.S. even if they entered the country illegally. ACLU attorney Lee Gelernt said that Trump is overstepping his authority by changing asylum rules that were established by Congress. "Congress has specifically said that people can apply for asylum regardless of where they enter," said Gelernt. "The administration has overriden that unilaterally. It raises serious concerns about separation of powers against the backdrop of an enormous humanitarian crisis where people are going to be sent back to be persecuted, possibly killed," he added. "As documented in our case Al Otro Lado v. Nielsen, the Department of Homeland Security has a documented pattern, practice, and policy of turning asylum-seekers away from official ports of entry at the U.S. border with Mexico, thus pushing many asylum-seekers to cross the border without authorization in order to reach relative safety." The migrant advocates are asking U.S. District Judge Jon Tigar for a temporary restraining order to stop the administration from implementing the asylum restrictions nationwide. In a court filing late last week, lawyers for the Justice Department argued that the president has "broad discretion to suspend the entry of aliens into the United States." They said the new rule had to go into immediate effect to avoid creating a rush on the border and that the administration has the right to require asylum-seekers to present themselves at ports of entry. An attorney for the Justice Department, Scott Stewart, argued that the regulation to limit asylum was justified. He said too many immigrants are crossing the border illegally with quote "meritless claims of asylum." But during the court hearing Monday, Tigar, an Obama appointee, appeared skeptical. He admonished the government's lawyer, telling him: "To say something is true is not to make it true." The second legal challenge to the administration's asylum policy took place in a federal court in Washington, D.C., where a judge heard arguments on whether domestic abuse and gang violence justify asylum claims. Earlier this year, the Trump administration adopted a new policy that says domestic violence and gang violence generally cannot be used as grounds for an asylum. But immigrant-rights groups say the administration ignored decades of legal precedent that says they can be grounds for asylum. And they're asking Judge Emmet Sullivan of the D.C. District Court to block the policy. "Asylum was never meant to alleviate all problems — even all serious problems — that people face every day all over the world," said then-Attorney General Jeff Sessions in June when he announced the policy change. The lawsuit, Grace v. Sessions, was filed by the ACLU and the Center for Gender and Refugee Studies at the UC Hastings College of the Law. In a court document, the groups argue that barring claims of domestic violence and gang violence is "arbitrary and capricious." In the hearing Monday, ACLU attorney Jennifer Chang Newell told Sullivan that she has 12 plaintiffs who were denied asylum and that six of them have since been deported. She asked Sullivan to allow them back into the U.S. and give them another "credible fear" screening. But the judge questioned whether the court had the authority to bring back immigrants already removed by the government. Both Sullivan and Tigar said they would issue their decisions later on. NPR's Joel Rose and Rebecca Ellis contributed to this report.